Plant: An annual herb with dark green leaves and white flowers that grows to 60cm. 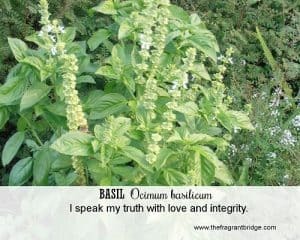 Interesting snippets: Basil is considered one of the sacred herbs of India where it is dedicated to Krishna and Vishnu. 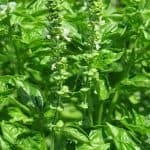 In Ayurvedic medicine basil is combined with black pepper for malarial fever. 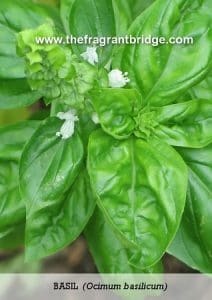 In Italy, basil was associated with love but in Greece it was associated with hate and misfortune and is a symbol for mourning. Part of Plant used / Extraction: Flowering tops by steam distillation which lasts around 1½ hours and yields an average of 1% oil. Emotional and Spiritual: mental fatigue, stress, gives the mind strength and clarity, fear, sadness and depression. 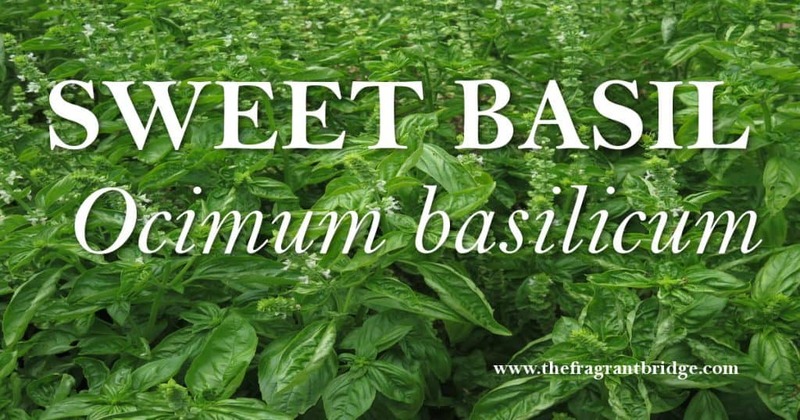 Gabriel Mojay writes that basil is indicated for those in whom despondency and dejection are coupled with a heightened need for emotional support and reassurance. Basil can be helpful when you are at a crossroads in life or going through a spiritual death. She supports you in overcoming doubt, worry and anxiety allowing you to trust in spirit and renew your zest and enthusiasm for life. 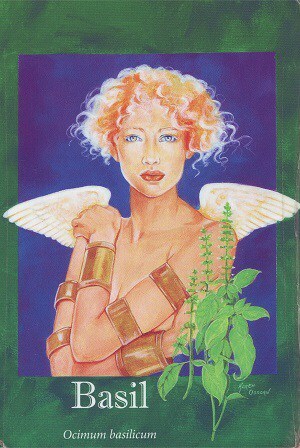 Basil increases self-expression by opening the heart and mind. 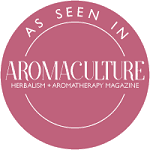 The herb of love is for those in life who are able to utilize their intuition and express themselves in a straightforward manner, allowing them to move from a place of fear and live a life of positivity and clarity. Speak with enthusiasm and act with integrity from your heart, and then you speak your truth. Stop worrying just for the sake of it and get on with life. Fragrant Change Healing Card: I speak my truth with love and integrity. Are you belittling and putting yourself down or are you speaking positively to and about yourself? Have you been wounded deeply by the words or actions of others? It’s time to speak your truth with love and integrity. You may have been hiding the truth from yourself and others because of feelings of low self-worth, low self-esteem or from fear of what others will think of you. It’s now time to reveal your true thoughts and not say what you think they wish to hear. This does not mean using your words to wound but simply expressing your point of view in a calm manner. Take note also of the way you speak to and about yourself. Remember your words have power, use them wisely. Safety: Avoid using on individuals with hypersensitive, diseased or damaged skin. There is a low risk of skin sensitization. Some sources also recommend not using basil during pregnancy or on children under 2 years of age. This entry was posted in Essential Oils and tagged basil essential oil, menstrual cramps, mental fatigue, stress on August 30, 2017 by Carole Hodges. 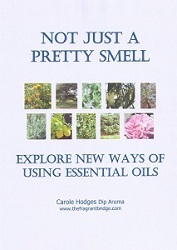 There are many essential oils but only a few that have been considered sacred. By that I mean oils or incenses that have been used in churches, mosques and temples for spiritual purposes. Some are used to bring calm to the people praying, others as an offering to the Gods so that he/she/they may hear and respond to their prayers. Others are used to put the person into a meditative state. Many are useful in our own spiritual work to purify the space and for meditative work. 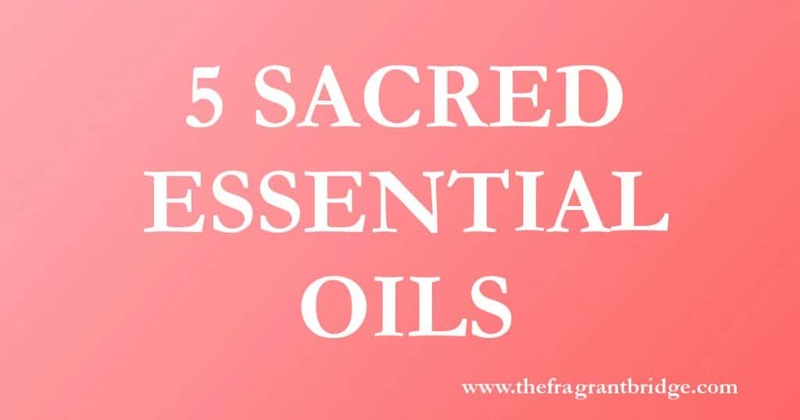 The following 5 oils can be considered sacred. Agarwood also known as Oud is very expensive whether as incense, wood, chips or essential oil. She has been burned as incense for centuries by many religious groups including Buddhists, Christians, Hindus and Muslims during prayer and meditation to help people achieve a higher level of consciousness, euphoria, calm and a deep inner peace. She was also used in Ancient Egypt to embalm bodies during the mummification process. The oil is harvested from the resinous wood caused by a fungus infection that changes the colour of the wood from a light brown to almost black. 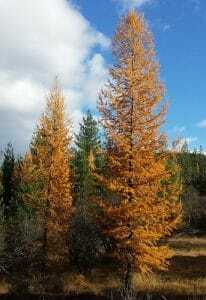 The tree is endangered in the wild but there are now plantations growing the trees and infecting them with the fungus. As the oil is so expensive one or two drops can be added to 10 mls of cold pressed vegetable oil and used as an anointing oil. Another way can be to add 4 drops to a personal inhaler and inhale a few times before and perhaps during your meditation session. Frankincense is an oil that has been used since ancient times and is one of the gifts given to the baby Jesus by the 3 Wise Men at his birth. Rather than an essential oil it is more likely an infused oil or resin was used. In ancient times frankincense incense was burnt to honour the Sun gods – Ra in Egypt, Apollo in Greece and Bael in Babylonia. Today frankincense incense is used during ceremonies in Christian, Islamic and other faiths to purify, venerate, bless and sanctify those participating in the mass or ceremony. As in times past frankincense incense is seen as a symbol carrying the prayers and hopes of the people to God – a link between heaven and earth. Frankincense deepens and slows the breath inducing a state of focused contemplation and tranquillity allowing you to communicate with God, a higher wisdom or your own inner guidance. She is calming and uplifting purifying both the atmosphere and aura. Frankincense therefore can be used to enhance your meditative practice, offer spiritual support and/or promote a spiritual awakening. 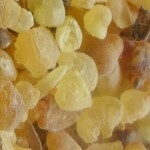 Frankincense essential oil can be used in a diffuser or as an anointing oil while the resin can be burnt as an incense. 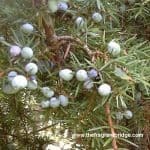 Many people may not think of juniper as a sacred oil but she has been used in religious and spiritual ceremonies for hundreds of years because of her cleansing and protective properties. Juniper branches, leaves and berries were burned in ancient Sumeria and Babylon to ward off evil spirits, purify the body, mind and spirit and protect from illness. Tibetans and Native Americans also burn juniper incense to drive off evil spirits causing illness and disease, to cleanse and purify the atmosphere and as a source of protection on a physical, spiritual and energetic level. Juniper is a strong tree and has been seen as a symbol of of strength, fertility and longevity for centuries. Use her strength and guidance either in a diffuser, personal inhaler or anointing blend to assist you in facing personal challenges with strength, courage, wisdom and determination. Clear the negative energies from a room after an argument or where there has been a lot of negativity by spraying or diffusing juniper. Clear your aura after visiting a shopping centre or crowded place by placing a drop or two of juniper in your palms and running them through your aura. Palo Santo means holy or sacred wood and was used by the Incas and Shamans to purify and cleanse the spirit from negative or stagnant energies to ensure good luck. South Americans smudge their homes to remove any negative energy. Palo Santo is unusual in that only wood that has lain on the ground for 4 to 10 years after dying a natural death will produce a high quality essential oil. For some this is seen as a representation of death and rebirth or vitality emerging from decay. It can also be seen as bringing something to its natural conclusion so that you can begin anew. Diffuse Palo Santo before or during meditation to calm, uplift and ground your mind, stimulate your creativity and allow your inspiration to flow. She will also aid concentration and a sense of being protected from negative influences. 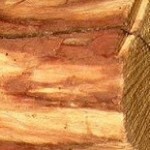 Sandalwood has been used for religious purposes by many different religions around the world. In India the Hindus add sticks of sandalwood to the funeral pyre to help carry the soul into the afterlife. Muslims have a similar belief and anoint their dead with sandalwood and burn censors containing sandalwood and other ingredients at their feet to carry the soul up to heaven. Ancient Egyptians also imported the wood for use in embalming and ritual burning to venerate their gods. 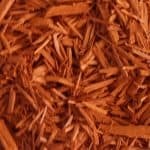 In India powdered sandalwood is used for making caste marks. A paste of sandalwood powder is applied to the forehead at religious ceremonies by Hindus while the oil is used to anoint sacred statues. Sandalwood is also seen as a symbol of vitality because it repels white ants and for this reason, sandalwood was once in great demand for the construction of furniture and temples. Temple doors were often carved from sandalwood. Sandalwood is still used today to make sacred objects, carvings and statues. I remember walking into a temple devoted to Kannon (Quan Yin) in Japan a few years ago and I could still smell the sandalwood emanating from the statue that had been carved a few years before that. Sandalwood incense sticks are used in many Hindu and Buddhist temples to promote meditation and prayer by quietening the mind and inducing a sense of peacefulness. In Indian homes incense sticks are used to free evil spirits and welcome the gods ensuring good luck and health for the inhabitants. The essential oil can be diffused during your meditation, prayer or spiritual practice to calm your mind, bring clarity and focus. She is both grounding and uplifting helping you to connect to the Divine. Sandalwood links the base to the crown chakra and has a protective energy. You may also like to make a chakra anointing oil using sandalwood and other sacred oils to balance your chakras. 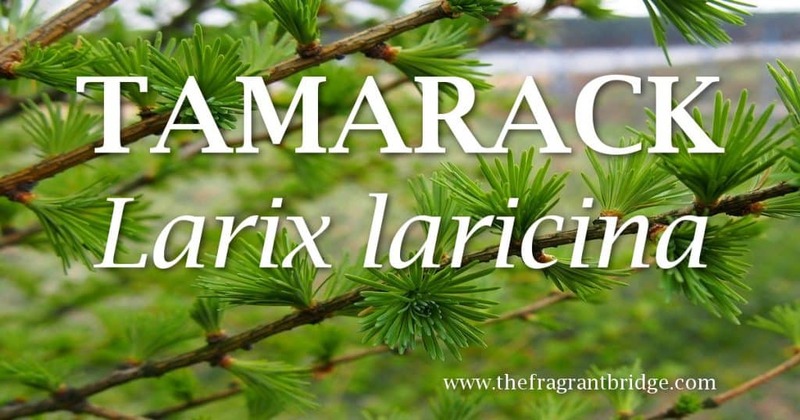 This entry was posted in Essential Oils and tagged agarwood, frankincense, juniper, palo santo, sacred oils, sandalwood on August 2, 2017 by Carole Hodges.